Now that the warmer weather is here, we’ve been grilling a few times a week, in addition to the weekends. This past weekend, my husband even made some crab legs on the grill for Mother’s Day. It was nice eating those out on the patio. They are so tasty, but so messy too! There’s so many things we make on the grill, but I’d have to say the funnest thing to make for us is kabobs. I mean who doesn’t just love food on a stick? Especially when it’s been grilled over an open flame. 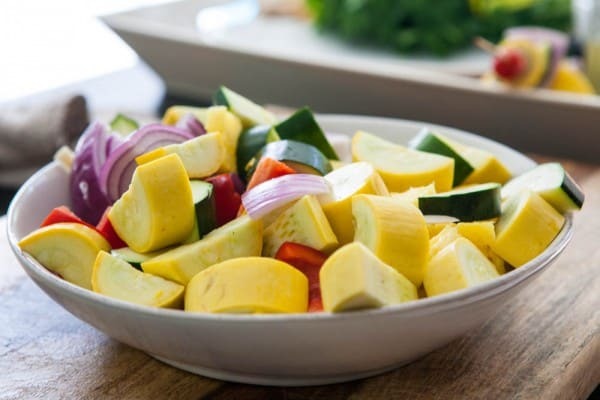 For these kabobs, I wanted to showcase the abundance of fresh summer fruits and vegetables, so I used a combination of summer squash, sweet bell peppers, red onions, pineapples and tomatoes to make a wonderful kabob perfect for health conscious people, vegetarians and kids. For the marinade, I just used a combination of lemon, garlic and Italian parsley to make a simple light flavor to compliment these kabobs. This marinade can also be used on grilled chicken, shrimp or a firm fish. 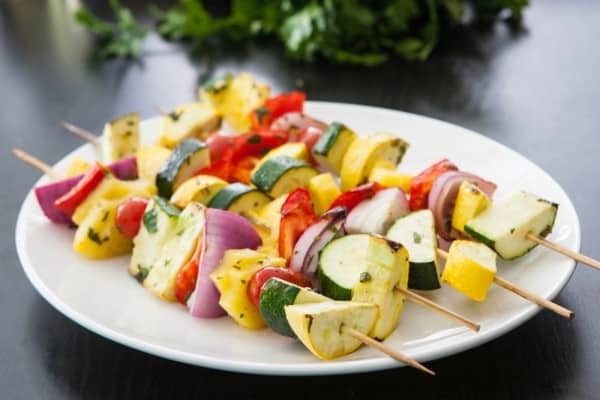 How fun would it be to serve some shrimp kabobs along with these tasty fruit and veggie kabobs! Before grilling these kabobs, I line my grill with Reynolds® Wrap Aluminum Foil. This foil is such a useful tool when I’m grilling delicate items like these kabobs. And it makes cleanup so easy! Just gather up the foil, and toss it in the wastebasket. Here’s a short video I did for this recipe. 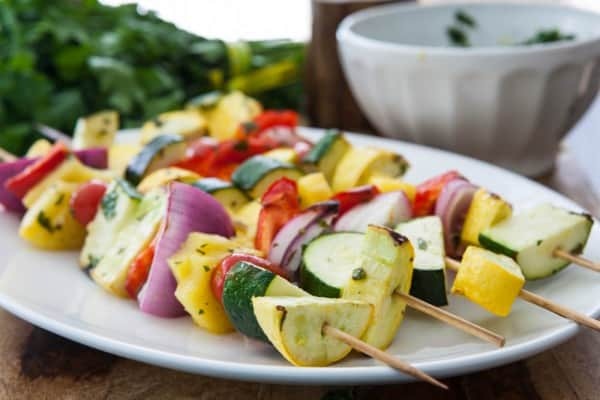 These fresh grilled fruit and veggie kabobs are a great healthy dinner your family will love. Plus, using aluminum foil prevents these kabobs from sticking to the grill, and makes clean-up a breeze. HEAT grill to low, 325°-350°. LINE grill with Reynolds® Wrap Aluminum Foil. PLACE kabobs on grill over aluminum foil, close grill lid and grill for 20–25 minutes, or until veggies are desired doneness. TRANSFER kabobs to a plate to cool before serving. 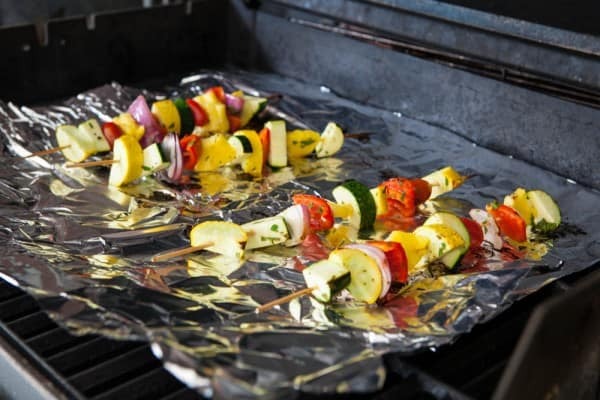 Aluminum foil stops kabobs from sticking to the grill, or fruits and veggies from falling off kabobs. For more recipes and Reynolds Kitchen Tips on how to Make Meal Magic, visit community.epicurious.com/makemealmagic! This post sponsored by Reynolds Kitchens. This is just aca-awesomeness! Kebabs are a staple in our house during the summer. We LOVE kabobs in the summertime. These sound amazing — that marinade! YUM. These look absolutely amazing – so perfect for the start of grilling season! I love that you mixed fruits with veggies! Such a great meal accompaniment for summer! We love kebobs too but I never remember to make them. Thanks for the nudge and for the inspiration on including all kinds of wonderful fruits and vegetables. The pineapple is a really nice touch! I see it complimenting the rest of the veggies and whatever protein you decide (if you do) pair this with. Beautiful – I like the fruit & veggie combo – different! At my house everything is better on a stick. These are so fresh…love the touch of pineapple too! Thanks for the recipe – Pineapple is a nice variation – Maybe I will try some orange slices as well for additional color. I’ve been looking for some last-minute Memorial Day weekend recipes, and this is perfect! Have you ever tried making kebabs with tofu? Is that even possible?